The accession record is the means by which the accessioning process is documented - an accession record is an administrative and descriptive document that summarizes standard information about the process of transferring materials to a repository, including information about the provenance, contents and legal and physical transfer of the records such as, rights and restrictions. It often precedes arrangement and description, and can be used as the basis for the creation of an archival description once the materials have been arranged. Sometimes archival materials are deaccessioned by an institution - the materials are removed from the collection for destruction or transfer of custody. To maintain a complete record, many archivists will create a deaccession record and associate it with the original accession record, rather than simply destroying all records associated with the former holdings. For long-term accountability and provenance, this is recommended practice. To create and manage deaccession records, you must be logged in to AtoM with a user account with sufficient edit permissions, such as an administrator, editor, or contributor. For more information on types of users and edit permissions, see User roles. For help logging into AtoM, see: Log in. Navigate to the accession record you want to deaccession. You can do this via the main menu in the AtoM header bar, by clicking on Manage > Accessions. For more information on navigation in AtoM, see: Access content. 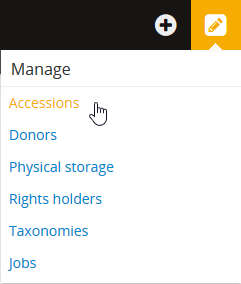 Click on the “Deaccession” button located in the button block at the bottom of the accession record’s view page. AtoM takes you to the empty deaccession edit template, open and ready for data entry. Note that the Deaccession number will be added to the original Accession record ID (shown at the top of the edit page). Add data as required. The Scope area is a drop-down menu: “Whole” or “Part,” so you can deaccession all or some of the records in the original accession. You can quit the creation process at any time by clicking the “Cancel” button in the button block; any data already entered will not be saved, and no new record will be created. Note that simply navigating away from the page by any other means, without first clicking “Create” will also result in no new record being created. To save the new record, click the “Create” button located in the button block at the bottom of the record. AtoM takes you to the view accession record screen. At the bottom of the accession record, there is a new “Deaccession” information area. The deaccession record has been added as a hyperlink to the accession record. To locate and edit a deaccession record, you must first navigate to its associated accession record. You can do this via the main menu in the AtoM header bar, by clicking on Manage > Accessions. For more information on navigation in AtoM, see: Access content. At the bottom of the related accession record, in the “Deaccession” information area, click on the hyperlink deaccession number. AtoM takes you to the related deaccession record’s view page. Switch from view mode to edit mode by clicking “Edit” button in the button block; this takes you to the record’s edit page. Add, remove, or edit data as required. You can quit the create process at any time by clicking the “Cancel” button in the button block; any changes made will not be saved. Note that simply navigating away from the page by any other means, without first clicking “Save” will also result in no changes being saved to the authority record. To save your edits, click the “Save” button located in the button block at the bottom of the record. Upon saving the record, AtoM will reload the accession record view page - you can click on the deaccession record hyperlink in the “Deaccession” area to return to the deaccession record to review your changes. To locate and delete a deaccession record, you must first navigate to its associated accession record. You can do this via the main menu in the AtoM header bar, by clicking on Manage > Accessions. For more information on navigation in AtoM, see: Access content. To delete the deaccession record, click on the “Delete” button in the button block. AtoM will take you to a warning page and ask you to confirm. Click on the “Delete” button to permanently delete the deaccession record. Alternately, you can click on the “Cancel” button, and AtoM will return you to the deaccession record’s view page.